Overlooking the world from the mountain peak sets your mind free. This slightly challenging hike which composes of more ascents and descents than some of our other options, will give you plenty of moments to clear your head. The greens of junipers and pines will be quickly replaced by the browns of old houses and terraced fields of corn and barley which perfectly demonstrate the cultural adaptation to nature. 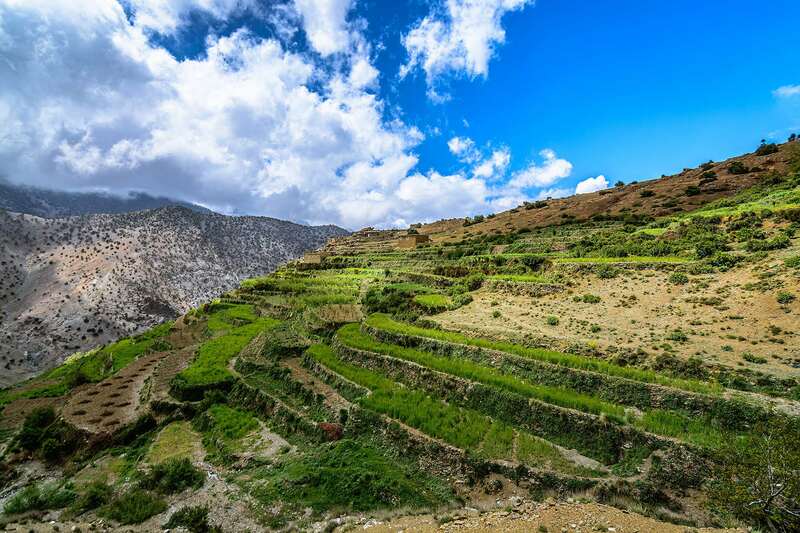 Berber villages are farming communities and terraced fields with their crops play a crucial role in the village life and economy. They are connected with ingenious irrigation channels so they are never without life giving water to the settlements. Throughout the trek it is curious to observe how the local people use the inaccessible terrain to get the most from it. All the fields are the same, but also different in detail. The day’s trekking will take you from Imlil, through Tizi n’ Tamatert to Tacheddirt. It involves around 5-6 hours of walking and takes you from 1740m above sea level to around 2300m. You’ll spend the night in a guest house in Tacheddirt and on your way there you can enjoy your lunch at the pass. Setting off from Tacheddirt, you’ll strike out for the red village passing many other dwellings as you walk. You’ll be travelling for a round 5 hours along the Imenane Valley; which is a simply beautiful area of North Africa, to get to Imsker to spend a well-earned night in local gite. At the end of your 3rd day, after 6-7 hours of trekking, you will be able to try the local steam bath or hammam. A steam bath is a wonderful experience at the end of a long day of travel and sightseeing. From Imsker, you’ll ascend from 1600m to 2100m at Tizi n’Techt, which enables you to gaze out across the Azzadene Valley; one of the most beautiful sights available in the region. After lunch at the pass, you’ll trek on up to Tizi Oussem where dinner, bed and a steam bath will be waiting. From Tizi Oussem, you and your group will return to Imlil. As you trek there, your guide will take you past the largest waterfall in the Toubkal region. Lunch will be in Tizi Mzik at 2500m and you can join your mules to finish the journey home to Imlil. The last day will have approximately 5-6 hours of trekking. From Imlil, you can transfer back to your hotel or lodgings.